They say that cycling is one of the toughest sports around. I’ve known that since I was fourteen years old and known it before getting into the saddle at all. Stuck at home by a puncture, a broken chain or a faulty cotter pin, I bent every spoon in the house for tyre levers, I sheared the corners of nuts with pliers for the want of a spanner. More often than not I left the bike worse than when I started, and I prayed for a big brother to appear, rescue the bike from an early grave and me from despair. To simply get moving on the bike was the first great triumph. To wake up in the morning and see the bike there gone, swiped in the night by a traveller on his way home from a disco brought more misery and crá chroí, until it came home again, rescued from upside down in a ditch in a faraway townland. Connemara is no place for the fair weather cyclist. Wind and rain, hillock after endless hillock, potholes and long, lonely stretches of bog roads may account for the fact that there are few cyclists to be seen on our roads except for the few local stalwarts, the tanned tourists and rent- a-bikers in the Summer. There are few more beautiful places to be on a bike though ; quiet roads where corners open into vistas of lake, sea and mountain, loops of routes that are best begun against the wind so that, however long and windswept, they will always turn and blow you home in the end. The Connemara roads are a far cry from the smooth roads through sun-scorched fields and up the gaping Pyrenees and Alps of the Continent. But no-one mentioned that to my teenage imagination. It took just one man to bring the multi-coloured world of the professional cycling peloton to life in my head on a battered Raleigh over a bog road in the 1980s. Sean Kelly was one of four Irishmen on the professional circuit in those days together with Stephen Roche, Martin Earley and Paul Kimmage. As a nation we took pride in them all, but for me he was the one. Sean Kelly grew up in the townland of Curraghduff, County Waterford. He was one of the most dominant and successful road cyclists of the 1980s and is listed as the third greatest road cyclist of all time. 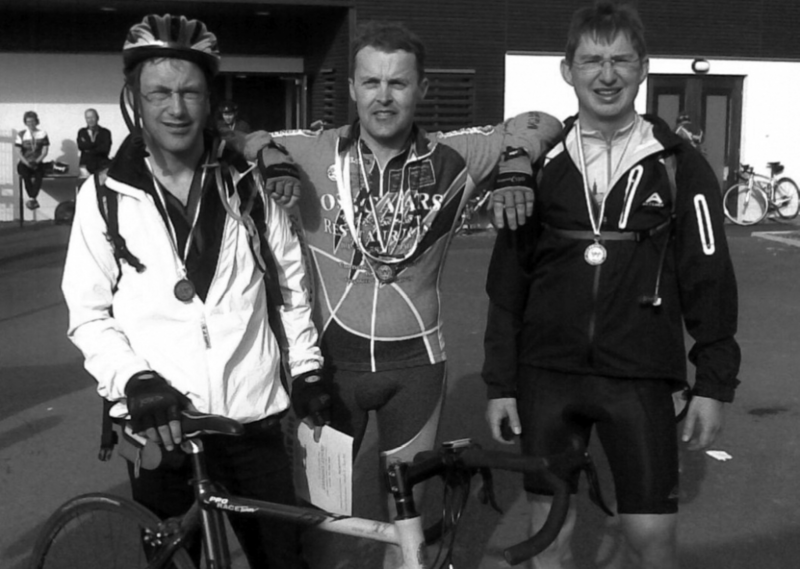 Gavin Evans, Michael Gannon and Damien Evans on completion of the Wicklow 200km Challenge in 2009. Photo courtesy of Michael Gannon. I had missed out on the local bike racing scene by a few years. I am too young to have raced them but old enough to have seen and sensed the excitement of bike racing at the Renvyle Races over bumpy grass pockmarked with rabbit holes. The trophies won there by older brothers adorn the mantlepiece at home. Not to be outdone, our father recalled leaving Tullycross by bike once at twenty to twelve in the 1950s and coasting into Clifden to the sound of the Angelus Bell of St Josephs; an average speed of 30 mph over ten miles if the timing system was accurate. He was a young council worker then, and he was quickly advised by his workmates to slow down as the return journey to Clifden was supposed to be a day’s work. Feats of speed and of great distance were the norm for his generation who lived and loved by the bike. If the advent of the bike to Connemara in the thirties and forties could bring men physically to new parishes for sporting and courting, was it any wonder that by the 1980s it could bring a teenager to the top of the Alpe d’Huez, even if only in his imagination? In the 1980s in Renvyle, my teenage years passed with a love of sport but a sense of being removed from the mainstream and colour of great sporting culture and events. Gaelic football was there for us all (or so I thought, until years later a Renvyle man told me he couldn’t play with us as a teenager because he had no boots) and I fought to hold down a corner back spot. We never relived, though, the exhilaration of making it to an under 14 county semi-final in 1982, the seasons were short and subdued. At county level I had a lingering, painful childhood memory of Liam Sammon’s missed penalty of 1974, the ugliness of the 1983 final I wiped from my young mind which thankfully until then had been spared that type of brutality. From our outpost at the far end of the county I rarely saw a County footballer in the flesh, and I heard so much frustration among the grown men around me, that it seemed to me these county men were to be disdained, until they would only win something. It may be no surprise then that I grew to idolise a far away champion like Kelly and to take to the bicycle, which apart from the mechanical frustrations mentioned above, never let you down. Remembered and written by Michael Gannon. Michael Gannon is a native of the townland of Derryherbert, on the Renvyle Peninsula, in the Parish of Letterfrack-Ballinakill.